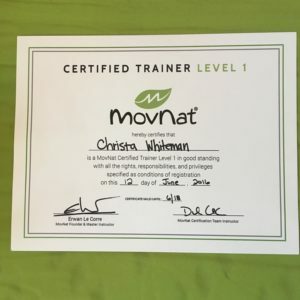 The other weekend, I had the privilege to attend the first women’s only MovNat certification course. I came home with my Level 1 certification and a new passion. It might be curious to some as to why someone with a doctoral degree would spend the time and money to get a little training certificate. The fact is, as a chiropractor, I’ve been passionate about natural human movements for quite some time. I think it’s bound to happen when you realize you are seeing the same common themes in people over and over again: tight hamstrings, lazy glutes and cranky psoas muscles from a lifetime of chronic sitting leading to poor mobility and increased compensation by the lumbar spine. I have glibly proclaimed in my office many times before that if it weren’t for people sitting all day, I probably wouldn’t have a job. It doesn’t seem like it would be a smart idea to work one’s self out of a job, but given our gross de-conditioning as a culture, as well as our predilection for a sedentary lifestyle because of the structure of our economy, I don’t feel insecure. Rather, I feel it my duty as a HEALTHcare practitioner to do the best that I can to educate people on how to take care of themselves. This sense of fiduciary responsibility is what eventually lead me to MovNat. How do you begin to teach people to move again? How do you do so in a balanced, thoughtful, personal and most importantly, effective, way? How do you take weakened, de-conditioned bodies and make them whole again, at any age? The cultivation of the body, when done in a continuous and progressive manner, constitutes physical education. It can be done entirely with natural movement patterns, without order or methodology, the same as in people living outside of civilized areas. So said George Hébert, who wrote his book, The Natural Method, in the early 20th century. Hébert was adamant that incredible fitness was the birthright of all human beings, not just the genetically gifted. In fact, he even went so far as to suggest it was a moral imperative for all humans to be fit. He was known for saying “be strong to be useful” to describe what was really at stake. Be fit not because you want to look good at the beach, but be fit because you never know when you might need to rescue your child from a mountain lion/alligator/gorilla (all recent news headlines). The other thing that Hébert was adamant about was that this training regime needed to be systemized. In this way, a coach or trainer could ensure that a person developed evenly a whole host of natural movement skills that led to adaptability in novel situations. For instance, it’s not useful to have gigantic muscles and 450# deadlift if you can’t swim and potentially rescue someone from drowning. Swimming was one of the core skills The Natural Method taught. Unfortunately, the system that Hébert created and successful implemented with the French Navy, as well as French school children, was pretty much decimated by the outbreak of WWI. (Those he had trained were so useful, they were often sent to the front lines of combat & other suicide missions.) His brilliant system of teaching everyday people how to regain their innate fitness as human animals was relegated to dusty bookshelves until Erwan Le Corre happened upon his book decades later. Inspired by Hébert ideas & system, Le Corre began training this way himself and created ‘The Natural Method 2.0’, known as MovNat. When I first heard of MovNat, it must have been from one of Robb Wolf’s podcasts. Instantly, it made sense to me and I was intrigued enough to look it up immediately. At the time, Erwan was teaching most workshops himself and there were only a few each year. I had my eye on going to Summersville, WV to take one ‘someday.’ Luckily for me, Erwan & his team have been very busy int he intervening years educating other instructors and attracting some seriously talented trainers. As I watched the growth of MovNat from afar and looked at what movement skills my patients were deficient in, I began to see the puzzle pieces fitting together. Here was the balanced, individualized, effective system I was looking for to begin to teach people how to move again. The only question left was- did I have what it takes to demonstrate enough physical competency in the basic skills to earn my certification? Just. 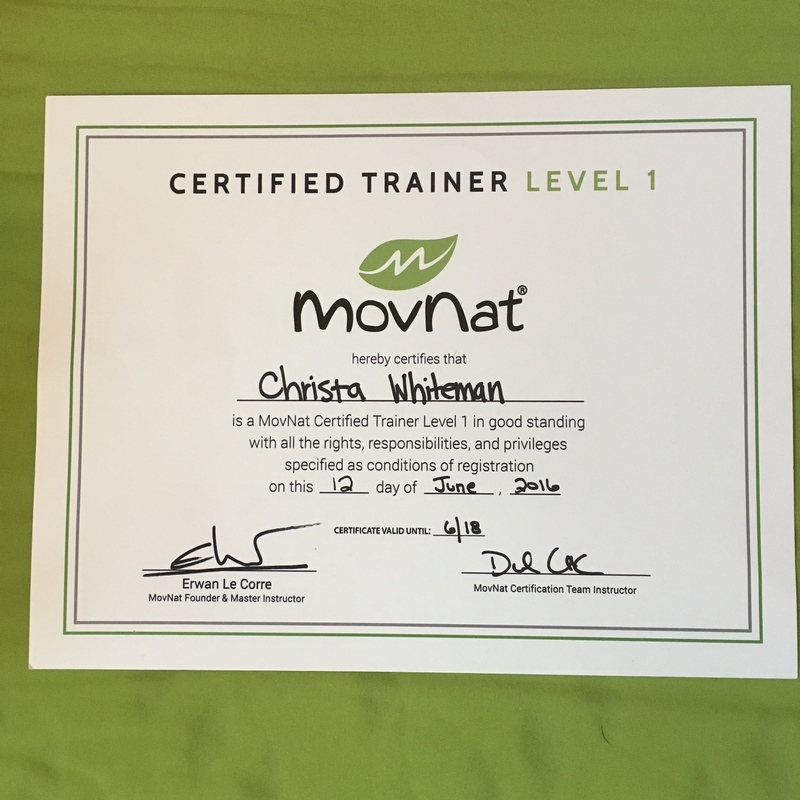 I came home from that certification grateful for the education I received on how to coach others as well as personal weaknesses and deficiencies that I need address. The certification weekend was just the beginning of my journey and I look forward to practicing, exploring and learning more. Moreover, many of the skills I learned were immediately relevant. Monday morning in the office, I was using a regression of what I had learned to teach an elderly patient how to breathe fully and start building the strength to be able to get off the floor with minimal assistance. In short, I got certified to be a better doctor for my patients. I want to have the tools to teach them how to maximize their health and maintain their fitness and vitality long into their golden years. To that end, I am currently working on offering movement-based group classes as ‘rehab’ for my patients. Stay tuned for details!!! Rewilding your feet can have many health benefits, which I discussed in my previous blog post. 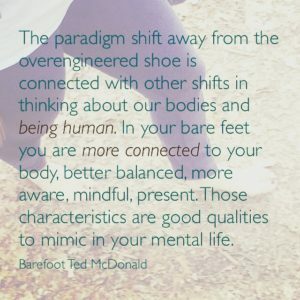 The key is to remember that if you’ve been wearing shoes, especially really built up shoes, for most of your life, you have to transition slowly to barefoot. If you’ve ever had a cast (or known someone who has) for a broken bone, then you’ve probably seen how small and shriveled their muscles were after getting the cast off. This muscle wasting is called disuse atrophy. The body very much works on the “use it or lose it” principle. While it’s not being used, the muscles cells are broken down and their constituents parts are either recycled of excreted. Shoes are similar to that cast. They’ve held most of your foot muscles and joints immobile in one position for a long time. The muscles themselves are small and weak in comparison to what they would or could have been without the shoes. As any natural bodybuilder could tell you, it takes time, patience and diligence to build muscle. Another thing to consider in rewilding your feet is the ‘toughness’ of your feet. Shoes are a protective covering and as such, your feet have not had the stimulus to build thicker, more protective skin on the soles of the feet. If we lived without shoes for most of our lives, our feet would have a nice little fat pad underneath the heel bone to help cushion them on hard surfaces. This heel pad is often very thinned and ineffectual in persons frequently wearing shoes. 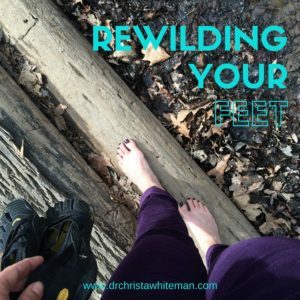 So again, I reiterate- you must transition to rewilding your feet and going barefoot slowly, so as to not risk an injury because of weak muscles, nearly non-existent fat pads and overly tender skin. 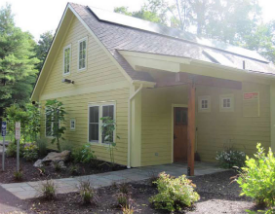 Begin by simply going barefoot more around your own home. (Slippers don’t count!) Socks can be used for purposes of warmth, but may not help your soles toughen up enough. Notice which surfaces in your home are more uncomfortable than others. (Concrete is an ‘unnatural’ surface and it can take time to stand comfortably on such a surface). Remember that its totally normal to be uncomfortable to stand for long periods of time like this. Start slow and work your way up. It will get better with time and patience. Once that feels comfortable, try small bouts of going barefoot in your yard or lawn (hopefully you don’t spray any toxic chemicals on your lawn). Sticking your barefeet in grass when its still covered in the morning dew is a divine delight!!! From there, you can begin to have barefoot adventures! I like to look for soft, mostly dirt trails to do short barefoot walks on. Use barefoot and minimalist shoes where appropriate. Something like the Vibram Five Fingers or Vivobarefoot shoes have very thin, flexible soles- just enough to give your feet a little protection while still allowing them to move through their full ranges of motion. By increasing the amount of time I wear such shoes, I have been able to strengthen my feet very safely over the last year. Do your corrective stretches!!! Remember that it’s not really just your feet that have adapted to wearing shoes- other muscles in your lower leg have as well. Stretch your calf muscles several times a day to provide them the stimulus to ‘lengthen’ after years of signals to ‘shorten’ because of positive-heeled shoes. Use a lacrosse ball and roll on the bottom side of you foot to break up any ‘sticky’ areas- bits of adhesive or scar tissue- that are limiting the range of motion of the various joints within your foot. Has ditching your shoes improved your health? I’d love to hear about it in the comments below! Musculoskeletal pain is one of the main things that brings people into my office. Most of us have resigned ourselves to pain simply being a part of life. We’re even told by the medical establishment that it is simply part of getting older. Pain from trauma or acute injury not withstanding, I generally don’t accept this ‘simply getting older’ argument. I think a much more likely culprit is the way we do or do not move our bodies on a regular basis. Ever known someone who has a bunion on one foot and not the other? If this was just genetic condition (as some people believe it is), it should happen on both feet because your feet are not genetically different from each other (unless you are the world’s first walking foot transplant recipient). The bunion develops on the foot where there has been downward movement of the arch, toward the ground. This results in forces that push the big toe to the side as the foot rolls over it or “toes off.” The bunion is a callous of bone that develops in response to this force. I could go on, but for the sake of brevity, I won’t. The point is this: despite what it may seem, your bone structure is not fixed. Neither are your muscles. They simply react to the loads and forces placed upon them on a regular basis. So how do you ‘fix’ this and end your musculoskeletal pain? The solution is simple, but its not easy. It requires a daily commitment. A commitment to move more- through a variety of ranges, positions and conditions. It requires a transition away from positive-heeled, overly built footwear, to zero-drop or minimal footwear. It requires a transition away from sitting at your desk in front of a screen all of the time, to standing, squatting or even sitting on the floor more and taking frequent screen breaks to ‘rest’ your eyes. It requires doing the daily work of performing corrective exercises that stretch and lengthen tight tissues while also committing to doing work to strengthen weak areas. In short, it requires commitment to a daily movement practice. In the meantime, if you are struggling with musculoskeletal pain and are looking for a doc who will help you work to fix the root cause, give my office a call at 845-687-6387. Our bodies are designed and capable of doing amazing things!!!! Are you suffering with neck pain and wondering what can be done about it? Have you tried chiropractic or physical therapy with little benefit? Are you afraid drugs or surgery are your only options? I just had a patient leave my office. It’s be a few months since I had seen her. Prior to starting to see me, she’d see a chiropractor monthly for an adjustment, otherwise her low back would really start to bother her and prevent her from doing things she needed to get done around her house. When she first came to me, we addressed her low back. In 2-3 visits, I fixed it. Not like ‘oh, it’s 75% better and as long as I don’t do x, y, and z, I’m fine.’ Fixed it, as in, 100% gone. Buh-bye. She even does the stuff around the house she was afraid to do before lest her back go out. How did I do this? I was able to fix her low back because I also looked at the muscles around the spine- the ones that support it and attach to it- and instead of adjusting the spine (which she had already experienced plenty before walking into my office) I addressed the muscle imbalance. Problem solved and she no longer needs a monthly visit just to keep it at bay. That exercise you gave me fixed my neck! I haven’t had any neck pain since then! The exercise I gave her was nothing extraordinary or profound. It was just a simple chin retraction exercise. But it lengthen the muscles in the back of her neck so that her head could rest balanced over the rest of her spine, instead of coming forward of her torso. This was causing an increased load to the muscles like her trapezius and levator scapulae (in the back, these go from the shoulder blade to the top of the neck and help ‘hold’ the neck up). Your head weighs about 12 pounds as it is, and every inch it moves forward, it gets 10 pounds heavier. Unfortunately, most of us do this all day long. We sit starring at screens, at smartphones and now tablets, with our heads subtly coming forward so we can see better. Then we go to bed at night, stick a pillow under our heads to jack our head & neck in the air and replicate this posture again for the next 6-8 hours. Over time, the muscles in the neck become adapted to this position and there they stay, increasing the loads on your spine and neck musculature, leading to tight shoulders, knotted neck muscles, loss of joint space in the cervical spine and eventually arthritis, even things like stenosis in the neck. In short, this posture over long periods of leads to neck pain. Why does this happen? Does it happen because there is a ‘joint out of place’ in the neck or does it happen because the way we use our bodies on a daily basis is out of context with the way it was designed to moved? I work from the premise that it is the later. Just like fast food isn’t truly nourishing food that will allow us to realize our full health potential, unnatural positions & postures (particularly when engaged in for long periods of time), change our underlying movement patterns. If these patterns are out of context with the normal architecture of our musculoskeletal system… well the end result at some point will be pain and degeneration. Neck pain, back pain, knee pain- it doesn’t matter where the pain is because in the end, unless there was a precipitating trauma, it’s just a symptom of dysfunctional movement patterns. The empowering part of this point of view is that these problems can be fixed! Granted, it may take time. If you spent years in a certain position or using your muscles a certain way, it will take some time to undo that, but it is possible. And it’s more possible the younger you are, before arthritis starts to change the underlying shape of the bones. However, bones are constantly remodeling themselves in response to the forces placed on them, so there’s always the opportunity to change those forces and then change their shape. You are a product of how you move. You change the product by changing how you move! By changing the way my patient’s neck was functioning, we eliminated her neck pain. She did the daily work of stretching and doing the exercise. My part was simply to spot the dysfunctional movement and give the appropriate correction. I never needed to ‘adjust’ her neck. If you’re struggling with neck pain and other things you’ve tried aren’t working, feel free to give my office a cal at 845-687-6387. We can chat about how I may be able to help you the same way I helped my patient today. You can also get caught up by reading more here, here and here. In a nut shell, I’ve joked with many people that as a chiropractor, I have a job because people sit too much. I mean it light-heartedly, but sadly there is a kernel of truth to the joke. So what to do to be healthier, extend your life and lessen your bill at your local chiro’s office? It may surprise you, but the answer is not to simply stand all day long at work either. Walking work stations utilizing treaddesks have become en vogue recently as well. This is certainly better from a ‘calories burned’ perspective, but it still misses the bigger picture. Kale is a superfood, but if kale is all you ever ate, you’d still end up with a nutrient deficiencies. Same with walking. It has a ton of benefits for your body- you should do a lot of it. But if its the only way you move your body on a daily basis, you’re still going to be deficient. For instance, walking won’t do much for the balance of muscles in the shoulder girdle that need to hang, grip and pull. I could go on and write a whole big blog post about what you should do instead, but why reinvent the wheel? Katy Bowman has already written the book on the subject- literally. Her newest book, Don’t Just Sit There! is now available in paperback. Use the box below to sign up for my newsletter. You’ll get my free PDF 7 ‘Health’ Foods to Ditch to Lose Weight & Feel Great AND one lucky winner will be chosen to receive a copy of Katy’s book, on me. Giveaway closes on October 31, 2015 at midnight, so sign up today! Our big, wonderful brains. Arguably what makes us distinct as humans. We like to think that our brains developed in order to give us the ability to think and to create- and therefore give us the advantage that allowed us to develop language, art and civilization. Directly in front of the primary somatosensory cortex is the primary motor cortex- it gets the information about where your body is in space from the primary somatosensory cortex and then uses that information to decide which motor pattern to use. In order to reach for a glass of water, your brain needs to first know where your hand, arm, elbow and shoulder are so that it can tell those muscles and joints exactly how much to move and in what directs in order to reach out and grasp that glass of water. This all happens so quickly, so eloquently, so seamlessly that though we can create robots that can master the game of chess, they can’t move the pieces around the board as deftly as even a child can. So what does this mean for our brains and brain health? Well, to begin with, your brain works much like your muscles- if you use them, they get stronger. And if you don’t they get weaker and less useful. As we move, we get stronger (and smarter) because the movement of our bodies and the subsequent firing of neurons that that requires causes the release of a chemical called BDNF- brain derived neurotrophic factor, or as one author put it “Miracle-Gro for the brain.” Its whole purpose is to stimulate growth of brain cells- not just in the parts of the brain most concerned with movement- but throughout the entire organ. In a formal literature review, researcher Frank W. Booth showed that lack of movement was a factor in over 20 different chronic diseases. But even more poignantly, he wrote in his review “[s]edentary lifestyle is associated with lower cognitive skills.” Further studies showed that cognitive skills do not decline simply because we get older, they decline because we move less. Not only is movement a key piece of preventing and addressing dementia and Alzheimer’s, but it has also been shown to be as effective as SSRIs in treatment of depression, with longer lasting benefits and less side effects too. In short, you need to move to have and keep a healthy, keen brain throughout your life. Exercise is definitely part of this, but it is only a part. We generally think of exercise as any movement we do in order to stay healthy and fit. Movement is broader than this. Movement is anything that changes the loads on your cells and tissues. A simple changing of the load on your muscles will cause a change in the feedback an embedded mechanoreceptor will give the brain about where that muscle is in space. Therefore movement can be as simple as changing the focus of your eyes from near distance to far, getting goosebumps from a chill in the air, getting up from being seated on the floor, or even evacuating your bowels- there is a reason we call it a ‘bowel movement‘ and not a bowel exercise. Movement should happen throughout that day, all day long, providing plenty of input to the brain and stimulus for new neuronal growth. 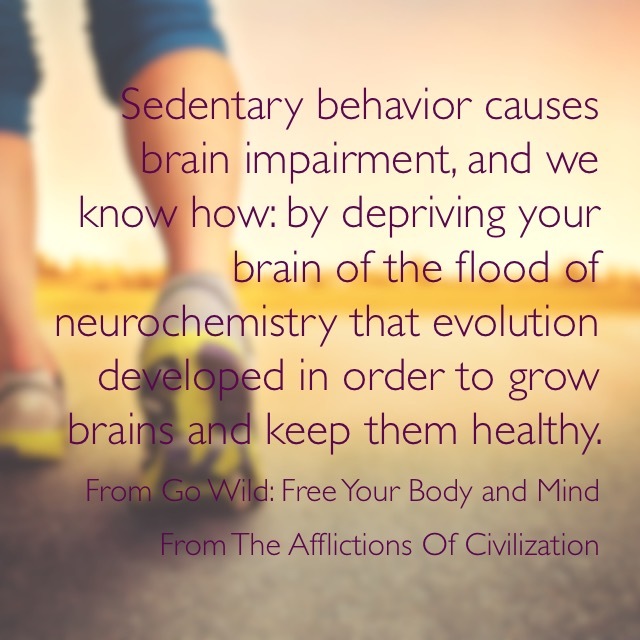 In contrast, when we spend 8, 10 or 12 hours a day being sedentary, sitting in a chair, and then go to the gym for an hour, we may get enough exercise to keep our waistline from expanding, but we are not getting enough of the movement we really need keep our brains happy and healthy. The best part about having a movement practice as opposed to ‘exercising’ is that it can be much easier to fit into what is probably already a busy life. Find errands you can do by walking instead of in the car. Growing a vegetable garden can provide more nourishment than than just from the food alone. Moving your positions through the day from standing to sitting on the floor and back again can provide plenty of novel movement and loads for your body. Working in the kitchen to cook can provide a nourishing meal and nourishing movement at the same time. Play with your kids on the playground instead of sitting on the bench and starring at your phone while they play. Walk the dog in the evenings instead of watching another hour of TV. Its not hard: walk, play, crawl, hike, lifting, bend, run, swing, hang- pretty much do anything but sit and watch TV or zone out in front of screen. If you’ve read this far, thank you. 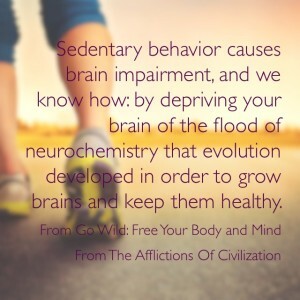 But now, for the sake of your brain health, please get out there and move!